Transparent Bingo WP 0117 is a casing waterproof / water repellent specifically for digital cameras sized medium. 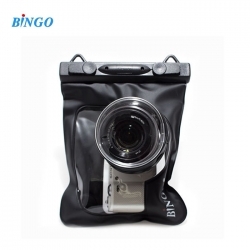 Suitable to take pictures under water to a depth of 10 meters. Ideal for swimming, surfing, kayaking, fishing, snorkeling, skiing, and the activities of other outdoor Protect safely against moisture, water, dirt, snow and sand Body Case is made ​​of PVC. Recommendation: - Be sure to check the product under normal circumstances and not disabled - It is recommended to test this case in the water prior to use on your gadget. Insert tissue in the case and input into the water to ensure the tissue in a dry state when removed from the case. - Rinse the case after use at sea so salty ocean water does not damage the quality of the case. - Wipe clean to dry after use case.